Acumar" inclinometer is used for measurement of range of motion (ROM). 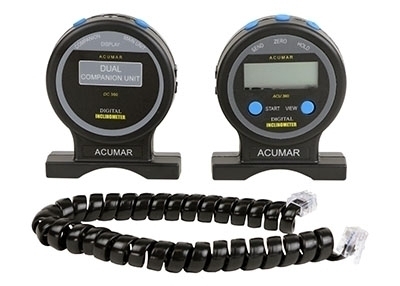 Acumar" dual inclinometer Package contains Digital Inclinometer and Companion Unit with case and connecting cable. Two-inclinometer technique and procedure is well defined in the 5th Edition of AMA Guides. Acumar Dual Inclinometer simplifies measurements and increases objectivity. The Acumar Dual Inclinometer can simultaneously capture both angles by the press of a single button. It allows up to six pairs of data for viewing and recording to greatly speed up data capture and analysis.